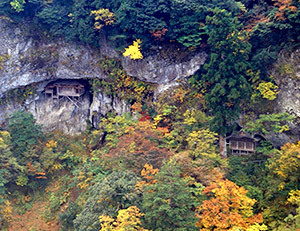 Since old days, Mitokusan Buddhism mountain was flourishing as the old sacred places. There are tourists visit to see a National treasure Nageiredo. Miracles scene. A number of training monks are visiting Mitokusan. Because the road to the shrine is very harp and some ways are just a chain on the wall to climb up, it is harsh and tough challenge to get up. Many visitors come to see the sight of the cliff located in a tough road. If you are confident with your health, please try the tough challenge to climb up the mountain. The approach to the Santoku mountain, there are also a few steep and dangerous points before climbing, so please pay extra attention when you go up.